Appliance manufacturers recommend cleaning of these vents atleast annually to prevent an increase in dryer run time, excess energy costs, and fire caused from lent accumulation and warm conditions. Can you imagine that sometimes a blessing may become a curse? In heating ducts, the addition of dirt and debris can cause health problems and a potentially life-threatening situation: dryer fires. 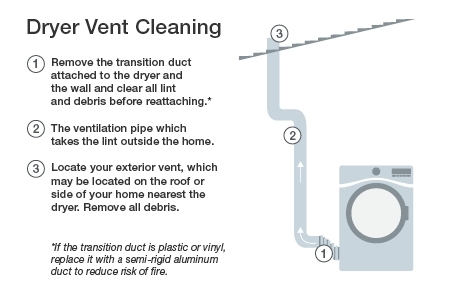 Call us for our Dryer Vent cleaning expertise, and prevent this problem. We offer an instant quote, just fill out the form on the right. According to reports of The Consumer Products Safety Commission, annually more than 15,500 dryer fires take place, causing more than $75.5 million in property damage, injuring 380 people and killing 20. In most cases, the reason is lint in the heating element, often caused by lint and blocked air flow in wrongly installed or dirty ducts. Even dryers with safeguards are at risk to dryer fires. Moreover, clogged vents, dry your laundry less efficiently as each load takes longer to dry, resulting in costing you more in utilities by $10 to $30 a month. In gas dryers, blocked or faulty ducts can also cause flu gasses into the house and can be responsible for headache, nausea, weakness, disorientation and deep fatigue. By inspecting and cleaning your dryer ducts regularly you can not only prevent unwanted accidents but can also save energy, time and money, reduce humidity, household dust, and help preserve clothing as a lot of your phenomenally fancy fabrics are damaged by excessive heating.